We routinely work with nurses who are accused by their employers of impairment due to drug or alcohol abuse. We are very familiar with the Intervention Project for Nurses (IPN), its advantages and disadvantages, its contracts, its personnel, and its policies and procedures. We are also quite familiar with the interactions between IPN and the Board of Nursing. We have had a great deal of experience in working with the different psychiatrists, certified addictions professionals (CAPs) and evaluators which IPN routinely employs to perform its initial evaluations on nurses. Our clients routinely include nurses who are alleged to be impaired because of drug abuse, alcohol abuse or mental or physical impairments. We routinely consult, advise and work with nurses who are alleged to have sexual boundary issues. We routinely are consulted by nurses who have a positive urinalysis screening on a pre-employment drug test, who have false positives on drug tests because of the ingestion of a non-drug substance which causes a positive drug screen (such as coco leaf tea or poppy seed rolls), because of allegations that an ill or fatigued nurse who tries to do her job is "on drugs," who are accused of addiction and theft of drugs because of discrepancies in drug inventories or in the hospital Pyxis machine, or for any other number of reasons. We routinely consult with, advise and defend nurses facing all of the foregoing types of problems. 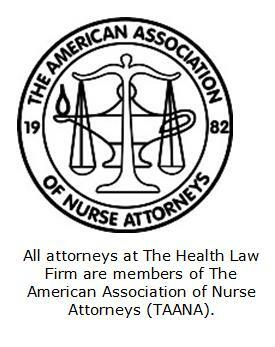 It is crucial that the nurse obtain qualified legal representation and advice (and many nursing malpractice insurance companies will pay for your defense in such cases), immediately, before speaking to anyone about the matter, before giving a urinalysis sample, before reporting yourself to the Intervention Project for Nurses (IPN) and before going for an evaluation by a psychiatrist or a certified addictions professional (CAP). These types of allegations made against a nurse are extremely serious because they are usually treated by the Department of Health as "Priority 1" or Fast Track" offenses. This means that the charges against the nurse will usually be automatically considered for an Emergency Suspension Order (ESO) by the Department of Health. This means that the investigation will be "fast and dirty" with a requirement that the DOH investigator have the entire investigation completed and the report in Tallahassee within 45 days. Then, unless a qualified, experienced attorney is able to immediately produce reliable documentation and other evidence showing the nurse is not impaired and is not a threat to patient health or safety, the Surgeon General (formerly the Secretary of the Department of Health) will issue an Emergency Suspension Order (ESO). This suspends the nurse's license until all proceedings are completed and finalized (which often takes a year or more). The nurse will be unable to work as a nurse during any period when her license is suspended and, even if she has a license in another jurisdiction, since the suspension is a public record which is widely published and other jurisdictions are notified, she may find her licenses in other states also suspended. However, even where the nurse may actually have committed the offense, there are a number of administrative and procedural measures which an experienced health care attorney, one familiar with Board of Nursing and IPN cases, may be able to use to avoid a suspension. This will also prevent the matter from becoming public until much later in the process. For the innocent nurse, an experienced attorney familiar with such matters may be able to obtain additional drug testing, polygraph (lie detector) testing, scientific evidence, expert witnesses, evaluations by certified addictions professionals, character references, or other evidence which shows that the nurse is innocent of the charges. IPN does have some advantages for the truly impaired nurse. It provides an avenue of monitoring, rehabilitation, monitoring and treatment for a truly impaired nurse. It is an invaluable tool to assist a nurse with a real problem to retain her ability to practice. Some nurses should not be practicing except through IPN. However, IPN also has some serious disadvantages and may, among other things, cause the nurse to lose his or her job, require the nurse to enter into long term inpatient rehabilitation, cause the nurse to undertake extremely expensive treatment, counseling and therapy, and impose very onerous burdens of time and money on the nurse, as well as work limitations. In many cases, the nurse who is the victim of a termination action by an employer or a complaint against his or her nursing license involving allegations of drug abuse, alcohol abuse, or impairment may view IPN as an easy way to avoid discipline. This is a complete fallacy. Such an apparent easy way out should be avoided at all costs. If the nurse is not truly an impaired provider or addicted to drugs or alcohol, there may be other alternatives that do not involve discipline. IPN is not "easy" and this is not an easy way out. It is extremely important that before you "self-report" to IPN you contact us for advice. It is extremely important that before you agree to go to the initial evaluation by an IPN recommended physician (usually one specializing in addictionology) (as IPN always requires), contact us for legal advice. We are familiar with many of the physicians that are used by IPN for these evaluations. Some are better than others and some are to be avoided at all costs. Before you give any blood, urine, hair samples or other drug or alcohol testing, you should contact us for advice. We have access to the same or similar testing labs as IPN. We can arrange to have you tested first so that you will know whether or not you should have any concerns. For example, did you know that the use of certain prohibited drugs (including cocaine) will leave a residue in your hair which can be detected for months or longer after use? Are you aware that there are now tests being used which can tell if you have had one regular size alcoholic beverage within the past thirty (30) days? There are even tests being used now to test health care professionals for the illicit use of anesthetic gases such as Aldan. Often a report against a nurse will be based totally on the suspicions of a supervisor, after observing a nurse at work who is actually exhibiting signs of illness or fatigue. Often circumstances which are totally beyond the control of the nurse, such as a shortage of drugs from an inventory for which the nurse is not responsible, or because there is a higher use of a certain drug on a certain ward or shift, or other factors for which there is no concrete evidence of abuse or impairment. An evaluation of your case by an experienced health care attorney may be invaluable in deciding whether you should defend yourself against the charges or enter the IPN program. We are consulted by just as many nurses who want to get out of the IPN Program after they agreed to enter it without proper legal advice. Even though at the time it seemed like a good idea, or the nurse incorrectly thought she had no choice in the matter, it turns out to be a big mistake for that person. We are told about 60 day, 90 day, and longer periods of inpatient drug or alcohol treatment required before the nurse can return to work. Nurses accepted into IPN must sign a five (5) year contract agreeing to monitoring, weekly counseling meetings, regular psychiatric visits, random urinalysis testing (with a mandatory call in every day of your life for the five (5) years), mandatory notification of all employers that you are in IPN and why, a strict prohibition on drinking any alcoholic beverage, or taking any medication (even over the counter medications) without the prior approval of IPN, possible loss of your privilege to administer narcotics, possible loss of your privilege to access any prescription medications, a possible requirement that you only work under the supervision of another registered nurse, and other possible requirements. In most cases, it is not possible to leave the IPN Program after agreeing to it without giving up your nursing license. And this can have some extremely adverse consequences for a nurse, including a report to the National Practitioner Data Bank (NPDB), exclusion from the Medicare and Medicaid Programs and debarment from all federal government contracting. The bottom line is: If you are accused of stealing drugs, of sexual boundary issues or sexual misconduct, or of being impaired, immediately contact an attorney experienced with IPN and Board of Nursing matters before doing anything else.